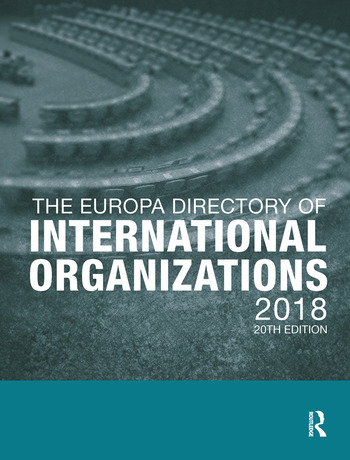 The Europa Directory of International Organizations 2018 serves as an unequalled one-volume guide to the contemporary international system. Within a clear, unique framework the recent activities of all major international organizations are described in detail. Given alongside extensive background information the reader is able to assess the role and evolving functions of these organizations in today's world. The contact details, key personnel and activities of more than 2,000 international and regional entities have again been thoroughly researched and updated for this 18th edition. - a fully revised Who's Who section with biographical details of the key players in the international system. - the response of the international community to crises and conflicts throughout the world. - introductory essays, written and updated by experts in their field, which consider topics including global environmental governance, the international criminal justice system, international humanitarian co-operation, and governance of the global economy.